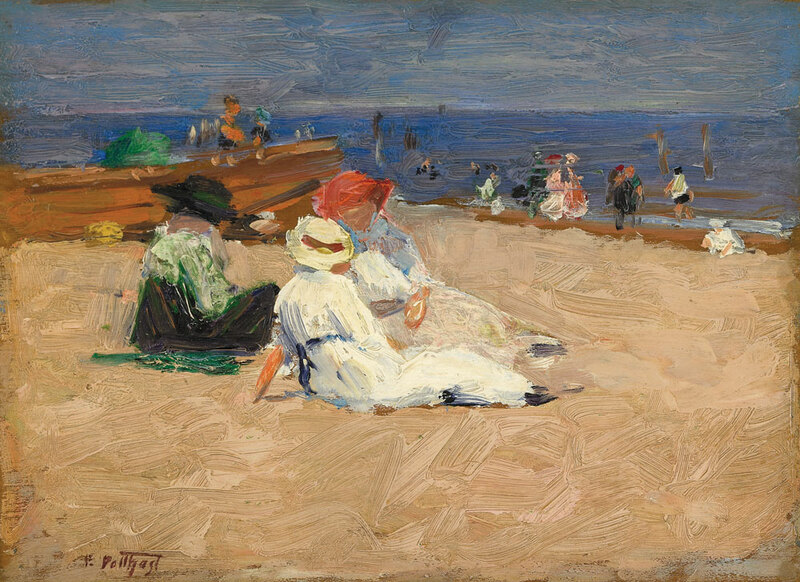 A painter of appealing impressionist works, Edward Henry Potthast (1857–1927) is best known for his cheerful and vibrantly colored beach scenes—two of which broke previous auction records for the artist by each selling for $1,384,000 in the spring of 2007. 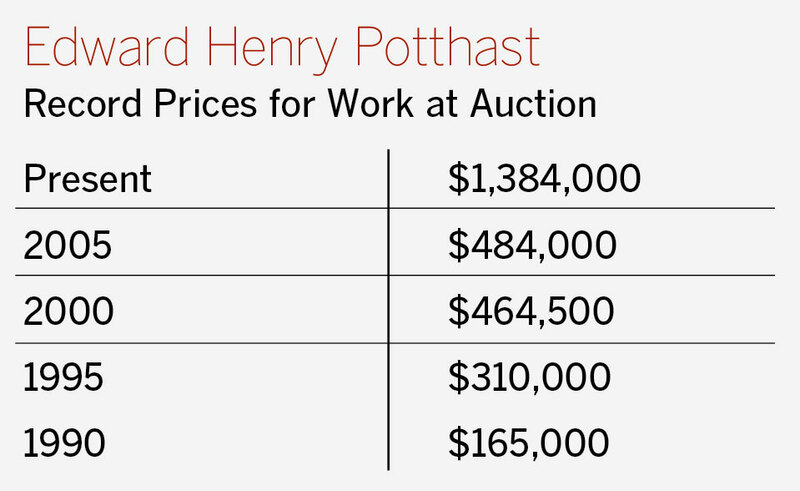 While these sales marked the first time Potthast’s work crossed the million dollar mark at auction, enthusiasm among collectors has brought prices for his paintings well into the six figures for quite some time. 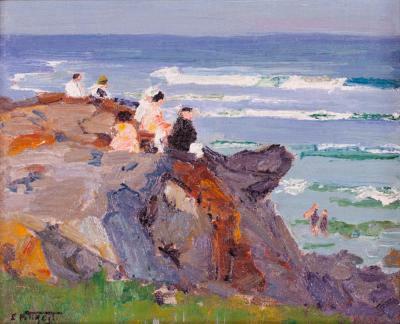 Edward Henry Potthast (1857–1927), A Hazy Day. Oil on board, 7-1/2 x 9-1/2 inches. Photograph courtesy of Godel & Co. Fine Art, New York. Born in Cincinnati, Potthast received his early training at that city’s McMicken School of Design. 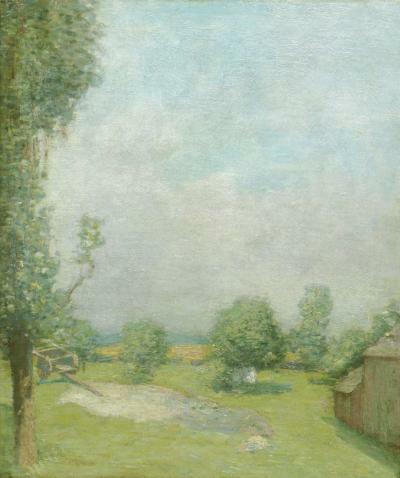 After departing in 1881 for study in Antwerp and at Munich’s Royal Academy (a destination for Cincinnati artists, many of whom, like Potthast, were of German descent), he returned to Ohio briefly, working as a commercial lithographer and continuing his studies. By 1887, Potthast had again set off for Europe, where he enrolled at the Academié Julian in Paris, and exhibited in the Salons of 1889, 1890, and 1891. During this time he encountered the works of the French Impressionists, and—influenced by time spent at the art colony in Grez-sur-Loing—began to develop his mature impressionistic style. “Potthast’s early student works are all over the place in terms of quality,” observes New York dealer Howard Godel of Godel & Co. Fine Art. “There are some exceptional works in museums, but he often produced second-rate realist paintings during his formative years.” The artist’s later color- and light-filled scenes made his reputation and remain his most sought-after works. Edward Henry Potthast (1857–1927), The Fairies, ca. 1915. Oil on panel, 12 x 16 inches. Texas Collector. Photograph courtesy of Godel & Co. Fine Art, New York. Edward Henry Potthast (1857–1927), Ladies in White Dresses, ca. 1910s–20s. Oil on panel, 8-1/2 x 11-1/2 inches. Private Collection. Photograph courtesy Gerald Peters Gallery, New York. 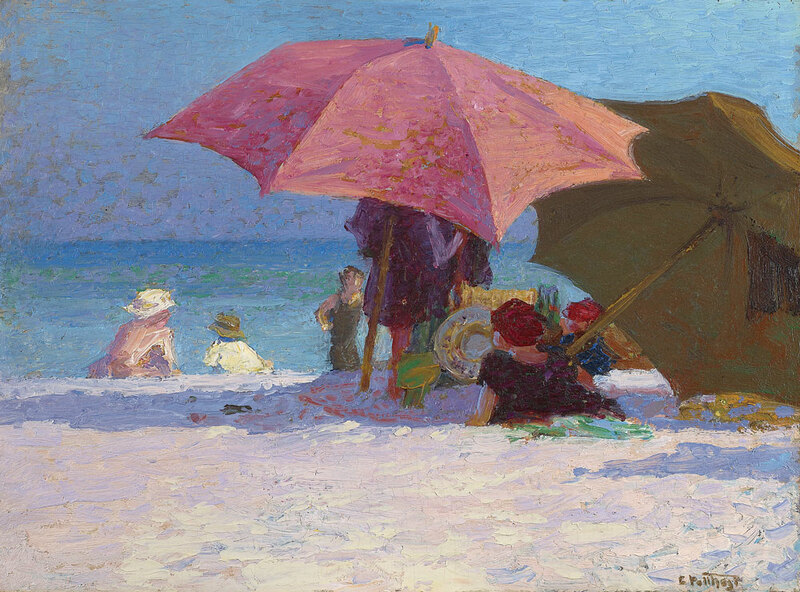 Edward Henry Potthast (1857–1927), The Shade, ca. 1920. Oil on panel, 12 x 16 inches. Photograph courtesy of Spanierman Gallery, LLC, New York. 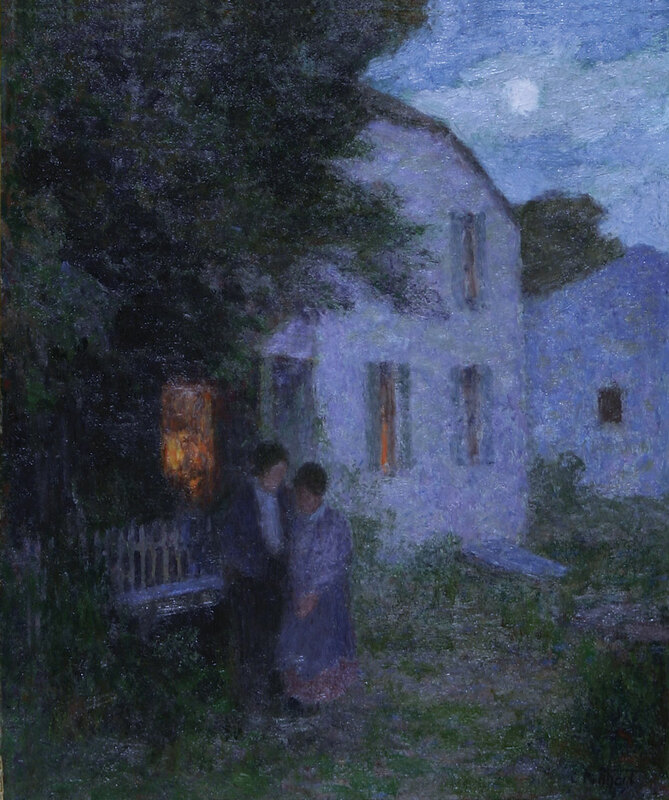 Edward Henry Potthast (1857–1927), Moonlight Stroll. Oil on canvas, 24 x 20 inches. 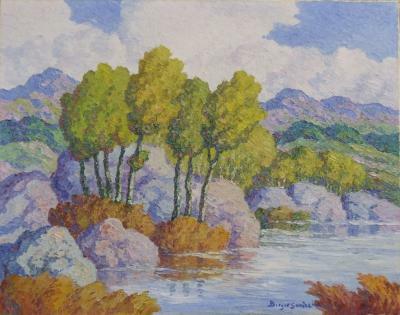 Photograph courtesy of Roughton Galleries, Inc., Dallas, Texas. 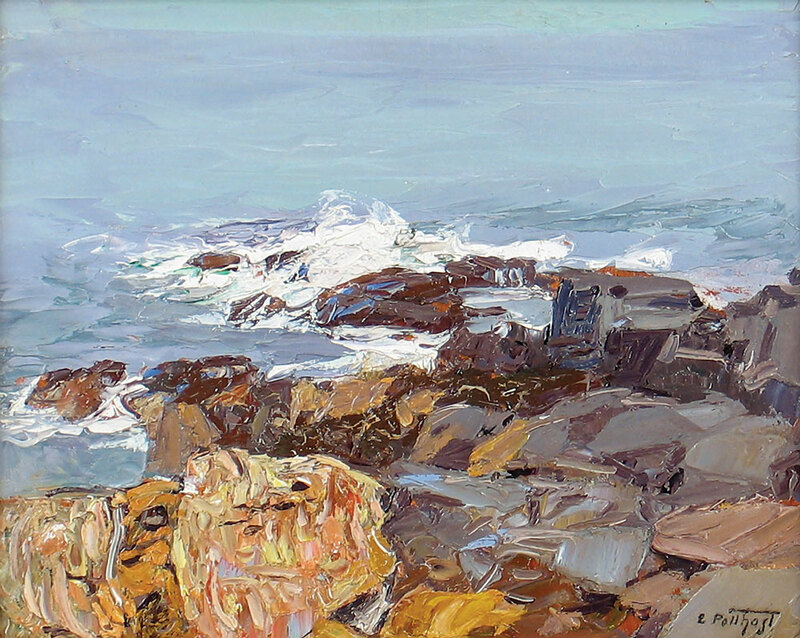 With similar titles attached to many works representing Potthast’s favored themes of harbor and beach—as well as the existence of a namesake nephew, also an artist—sorting out the artist’s body of work constitutes something of a challenge. Recent scholarly efforts will undoubtedly make things easier for aspiring collectors. Patricia Jobe Pierce’s twenty-plus years of research recently culminated with the 2006 publication of Edward Henry Potthast: More Than One Man. 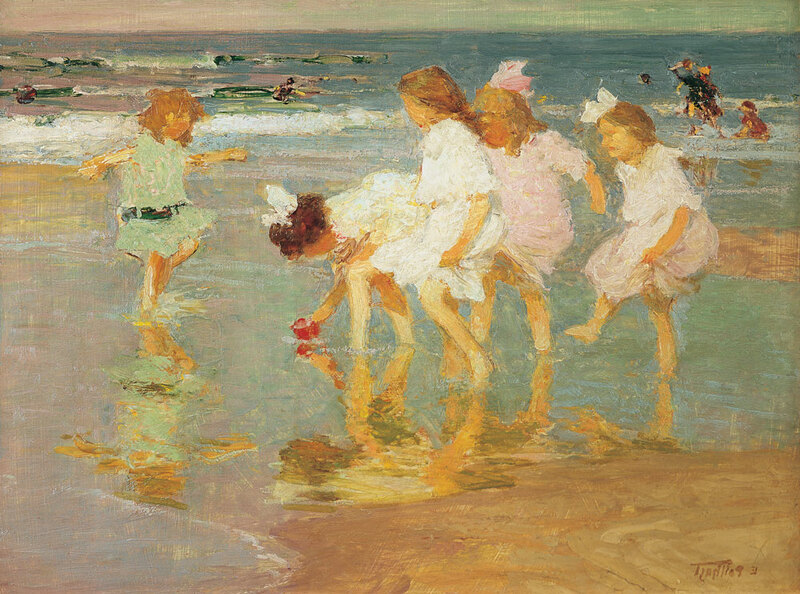 Not only a comprehensive look at the artist and his times, this 248-page volume also attempts to unravel the decades-long confusion surrounding the works of Potthast and his nephew, Edward Henry Potthast II (1880–1941), who studied with his uncle, pursued similar themes, and inherited a large number of his works. A second major research effort still underway is Cincinnati dealer Mary Ran’s catalogue raisonné of Potthast’s work, which she has been compiling since 1985. 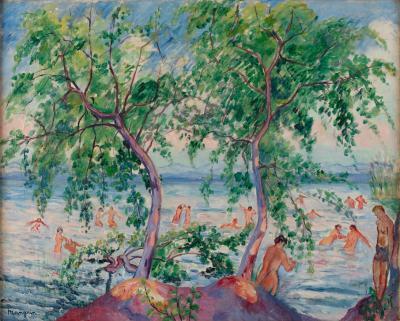 Having catalogued over one thousand works (with new ones still turning up), Ran remains particularly fond of the artist’s paintings of children and happy, peaceful playtime scenes, but has gained a newfound appreciation for his work ethic. Lisa Bush Hankin is director of research at Adelson Galleries in New York, where she specializes in nineteenth- and twentieth-­century American fine art.